The Red Arrow Walk is a short loop walk that takes about 20 minutes for a person of average health. It is 1.3 km and is strenuous in parts. Some people say it takes 40 minutes but I think this would be a maximum time. The Red Arrow Walk is extremely popular for local health enthusiasts very early in the morning and after 5pm every day. Mt Whitfield Conservation Park is an island of rainforest only ten minutes from the Cairns central business district and surrounded by suburban homes. Although not part of the World Heritage Area, Mt Whitfield provides an easy introduction to the tropical rainforest environment and contains two walks. The shorter 1.5 kilometre Red Arrow track takes about 40 minutes and includes a series of steep steps which meander through the forest to the top of a rise with excellent views of the city, ocean and mangroves. The path is well maintained and easily accessible. You will pass through a range of rainforest vegetation, introduced bamboo groves and a grassy open woodland at the top of the hill. Brush turkeys and other birds are easily heard and observed. Throughout the walk there are interpretive signs about the plants and animals. There are also numbered markers indicate places of cultural and historical significance which are described in a booklet identified. Bird and tree lists and Yirrganydji Cultural and Historical Trail booklets are available from the shop in the main gardens area. Originating as a recreational reserve in 1886, the Flecker Botanic Gardens were established in 1971. Today the gardens are managed by the Cairns City Council and encompass an area of 38 hectares which includes a wide variety of native and exotic flora. Attractions include an Aboriginal plant use garden, a rainforest boardwalk, the Gondwanan Heritage Trail, a fernery, an orchid house, fresh and saltwater lakes, and the Mt. Whitfield cultural and historical trail. The area is divided up into three sections - the main gardens on Collins Avenue, Mt. Whitfield Conservation Park, and Centenary Lakes. The Botanic Gardens are approximately four kilometres north of Cairns City Centre. Take the Captain Cook Highway (Sheridan Street) north, make a left turn onto Collins Avenue. The Red Arrow entrance is located just past the tanks, about a kilometre along. Public Transport is available on the Marlin Coast Sunbus. Route 18 departs from the Lake Street Transit Mall. The Flecker Botanic Gardens are now officially known as the Cairns Botanic Gardens. once you are on the track, so make sure someone knows where you are. Give yourself around 3 hours minimum for the return trip. And take plenty of water! For the adventurous, the 5.4 kilometre Blue Arrow track loops through the Mt. Whitfield Conservation Park. This is a long walk with rough track. Plan to head off early as the heat in North Queensland is extreme especially in Summer, Nov-Feb. This walk is a continuation of the Red Arrow walk and branches off near the top of the hill. This 2-3 hour walk can be rough and steep in places and is recommended only for fit hikers. You should carry water and wear strong shoes. Mt Whitfield and Mt Lumley are over 300 metres above sea level and offer spectacular lookouts over Cairns and surrounding areas. 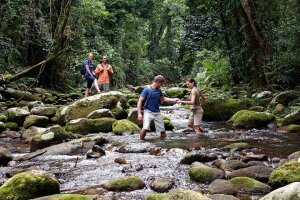 You will traverse virgin rainforest, open woodlands and creek crossings and are likely to see agile wallabies and other wildlife. Mt Whitfield Conservation Park is an island of rainforest only ten minutes from the Cairns central business district and surrounded by suburban homes. 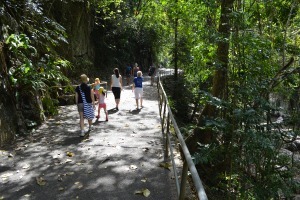 Although not part of the World Heritage Area, Mt Whitfield provides an easy introduction to the tropical rainforest environment and contains two walks. The Mt. Whitfield Blue Arrow Walk begins at the reserve's entrance on Collins Avenue, just past the tanks. There are regular bus services from the city centre, which is about 10 minutes away. While in the area, visit the rest of Flecker Botanic Gardens and take a stroll along the 500m boardwalk to Centenary Lakes, a favourite spot for bird watchers. The track to Lake Morris is located on the path to Crystal Cascades. Mobile reception is poor once you are on the track, so make sure someone knows where you are. Give yourself around 3 hours minimum for the return trip. And take plenty of water! 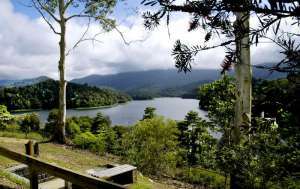 The walk to Lake Morris starts just next to the picnic area & toilet block at Crystal Cascades, about 150 metres along the path from the car park. The scenic path to Crystal Cascades is easy going and has many small waterfalls and a wonderful rainforest environment. I recommend jumping in for a swim after you tackle the Lake Morris trail. There are many spots to choose from along the path. The Crystal Cascades waterfall is located at the end of the path. Beyond this point are the water intake pipes, so no swimming is allowed past here. Some say 45 minutes to the top, but we beg to differ. This track is definitely not moderate. The first half hour is quite steep and then it tapers off. Make sure you have shoes with good grip. Once you have reached the timber power-pole, there is a nice view over brinsmead valley and towards Yorkeys Knob. From here on the track widens (for vehicle access) and is less steep. When you reach the yellow gate turn right and walk along Lake Morris Road towards the lake and lakeside Cafe. Just before you reach Lake Morris there is a sign with a map of the area. After the walk, I wanted to order everything on the menu. Coffee & Sandwiches were great! Enjoy the serene views over Lake Morris before some well-earned lunch. The less strenuous trek down the hill is a good chance to take in some of the surrounding rainforest environment. The track can be a little slippery so take your time & Enjoy! 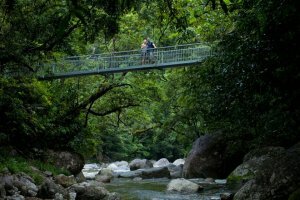 There are a range of walks that you can take into the Daintree rainforest - beach walks, boardwalks, guided walks and longer treks with real jungle trails for those feeling fit! The popular Mardja Botanical Walk is located 10 minutes drive to the south of Cape Tribulation. A boardwalk and concrete pathway leads you through high value rainforest with interpretive signs to Oliver Creek, where you can sit and watch out for crocodiles. The walk takes around 30 minutes, with the best times being early morning or late afternoon to avoid the tourist rush. There are also numerous tour companies offering guided day walks and nocturnal walks. You can experience the thrill of searching for crocodiles at night on the night walks, or learn about the history of the ancient Daintree Rainforest, its conservation, ecology, bush food, traditional culture and its unique wildlife on the interpretive daytime walks. Animal sightings on these walks include pythons, spiders and small native marsupials such as bandicoots and melomies. Mason’s Tours have guides who can take you to the best areas on real jungle trails. They do not use boardwalks or concrete paths, they are typical jungle trails perhaps resembling an Aboriginal Road that would have existed here before the arrival of Europeans. 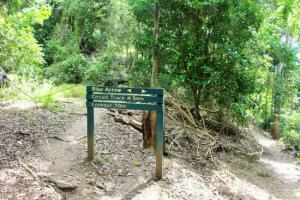 The half day walk is located on Mason's own 170ha property bounded by the Wet Tropics World Heritage Area. 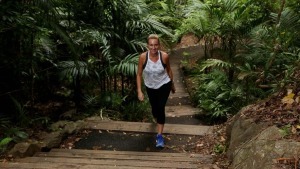 This slow paced walk covers 3 – 5km, features a special guide, real jungle tracks and a refreshing swim in Myall Creek – is there a better way to be introduced to the Daintree rainforest at Cape Tribulation? Coopers Creek Wilderness run guided walks daily. This section of the Daintree is considered to be the world's oldest rainforest - a living museum. Visitors to Coopers Creek can be assured that their contribution payments will assist the land managers in maintaining the rainforests of Cooper Creek Wilderness. These tours have been designed to provide exclusive experiences away from mass tourism. Douglas Track is a long walk on rough track with moderate difficulty. It is 9 kilometres and we suggest you allow at least 4 hours to complete this walk. Douglas Track is one of the various walks that make up a network of trails throughout Barron Gorge National Park. Cairns and Kuranda locals consider themselves highly fortunate to have such a beautiful, wild rainforest valley in their backyard. 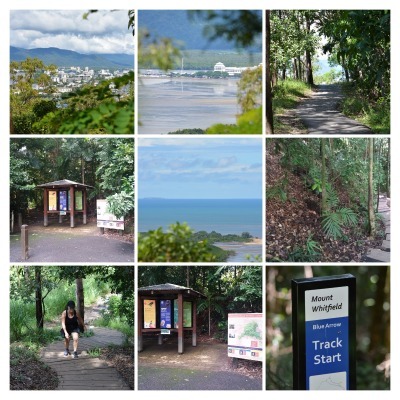 From the Rainforest Estate, the track follows an old sealed road up to a water tank and then winds through the scrub up to the Cairns-Kuranda railway line. From the nearby bridge you can continue climbing up to Red Bluff where McDonalds Track links in from Wrights Lookout. Red Bluff offers spectacular views down the valley, across Cairns suburbia and to the coast. This area has some historical significance, containing old railway and mining camps. From Red Bluff you can continue to climb along the ridge to Glacier Rock. Here is a wonderful spot to rest and take in the glorious scenery of the gorge below and the coastal vista beyond. The walk from Glacier Rock to Speewah is through some well preserved upland rainforest with frequent ups and downs and small streams. Keep an eye out for cassowaries and other wildlife. There are numerous links to other walks in this area, and it helps if you take a map. You can do the entire walk and arrange a pick up at the other end, or walk from either end to Glacier Rock (about half way) and back. Another option is to use Smiths track to return to your starting point. The Gandal Wandun Link Track (1.2 kilometres) can be used to walk from Douglas Track to Smiths Track closer to the Speewah end of the walks. McDonalds Track can be used to go from Red Bluff to Wrights Lookout near Barron Falls. Drive to Kamerunga and turn to Stoney Creek and the Rainforest Estate. Follow the road up the valley and park at Stoney Creek carpark and walk across the creek towards the weir. There is a signposted turnoff on your right to the Douglas Track. Or turn right at Douglas Track Road roundabout. At the top of the hill you will see a turn around area and signs marking the beginning of the walk. Turn left off the Kennedy Highway at Douglas Track Road (to Speewah). Take the next right onto Speewah Road and drive to Stoney Creek Road. Follow Stoney Creek Road past Kelly Road and across a small bridge. The track soon after on the left leads to the QPWS carpark. The track entrance is to your right, close to Surprise Creek. 2 hours drive South of Cairns is Australia's largest island National Park, Hinchinbrook Island. 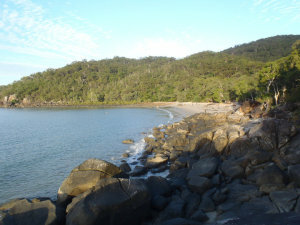 Hinchinbrok is separated from the mainland by the deep, narrow, mangrove-fringed Hinchinbrook Channel. The Island is approximately 37km. long and 10km. wide. Including the main beach at the resort there are 11 beautiful secluded sandy beaches.